Stylish & Clever Solutions for Storing All Your Cold Weather Gear! — Trim Design Co. Stylish & Clever Solutions for Storing All Your Cold Weather Gear! Is there a sacrificial chair or table near the entrance to you home that’s permanently piled with coats, hats, and scarves from November to March? Maybe you’ve got an ugly pile of winter boots by the backdoor or an overloaded coat tree clogging your hallway. If winter accessories are cramping your decor style, we’ve got 5 stylish solutions to corral the clutter while keeping your cold weather essentials within easy reach! Use a vintage filing cabinet or a lingerie chest instead of a console table in an entry or mudroom. Their narrow size makes them perfectly suited for smaller spaces, and the abundance of smaller drawers is perfect for organizing winter accessories. Give each family member a drawer for hats and another for gloves and mittens. This way you’ll not only have the clutter out of sight, you’ll avoid digging through a tangle of mismatched outerwear every time you need to grab you gloves! 2. 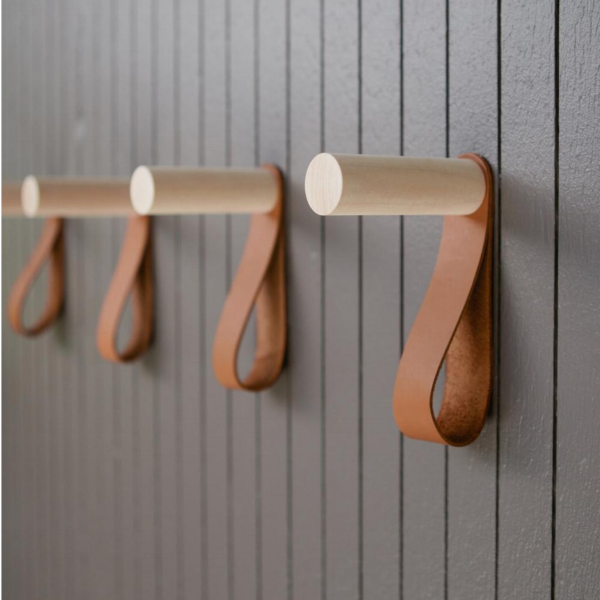 For scarves, hang some stylish, but low-profile wall hooks next to the cabinet, like these from Alice Tacheny which do double-duty with a peg and a leather loop hook. 3. If you’ve got built-ins in the area of your home where winter wear is stored, consider adding shutters to conceal the contents and visually declutter the space. 4. The space underneath the coffee table is an easily accessible yet often underutilized spot for stowing winter necessities. Use a stylish container like a vintage hat box to store kindling and matches for the fire, or extra pairs of wool socks for cold winter nights. 5. A stylish basket is a chic way to corral those cozy throw blankets that come out of the linen closet when the weather turns cold. Do you have a clever winter organization hack of your own? Comment to share it with us!